What Are Shapeshifters in Magic? In Magic, shapeshifters are an interesting clan who often bear the changeling trait, letting them count as every creature type and applying for every faction bonus you can imagine. 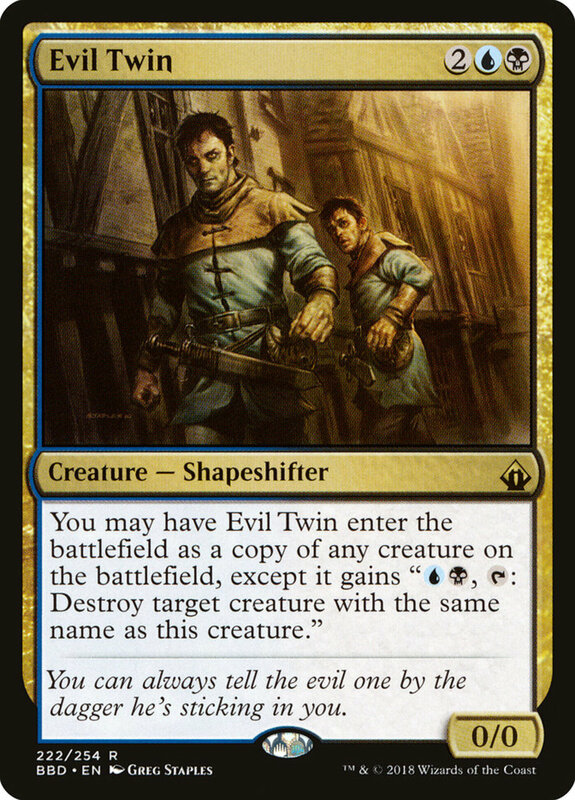 Other shapeshifters emphasize replication, entering the field as a copy of your or your opponent's best permanents. Shapeshifters often belong to the blue faction, but they're seen throughout many colors; with dozens of duplicating units available, which monsters reign supreme? These are the ten best shapeshifters in Magic: The Gathering! 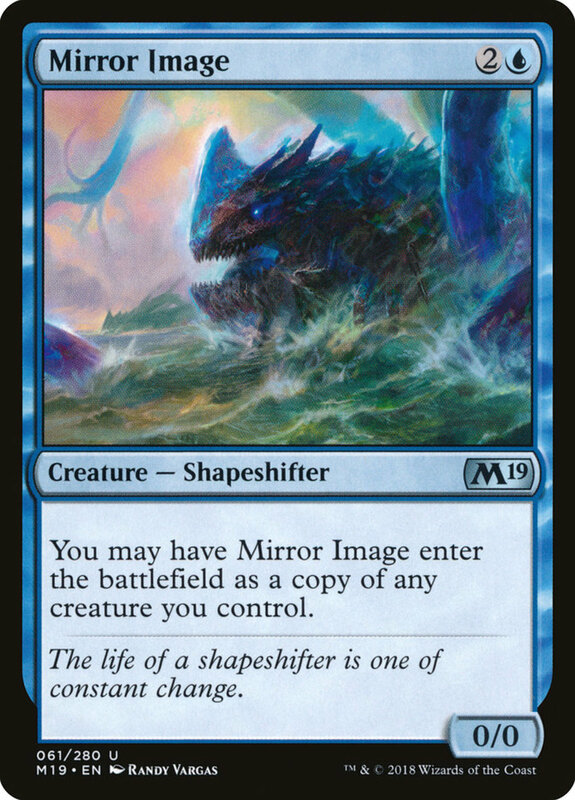 Compared to the standard four-cost "Clone" who can mimic any creature, Mirror Image needs one less mana to cast. However, he can only enter the field as a copy of a creature you control, so be sure to only use him when your deck offers several powerful behemoths to duplicate. Be sure to remember the legend rule; don't copy your own own legendary creature, or you'll end having to sacrifice one of your units. 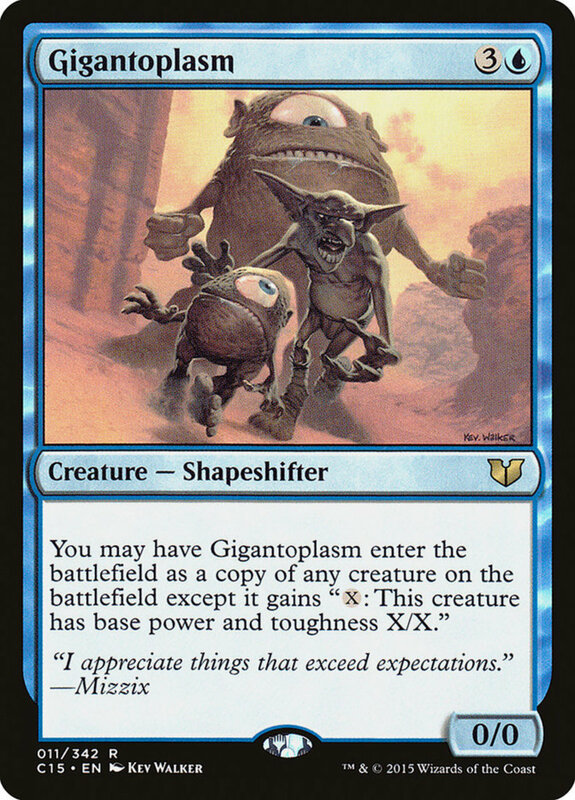 Gigantoplasm functions similarly to Clone, and like many shapeshifters, he costs a moderate amount of four mana. He enters the field as a doppelganger of any creature (yours or your opponent's). However, his copy gains an ability to spend X mana at any time and alter his stats to X/X, letting you upgrade your mold whenever you have enough resources. Just be sure not to cast Gigantoplasm when there aren't any creatures to replicate, as his default zero toughness (which many shapeshifters possess) will immediately send him to your graveyard. 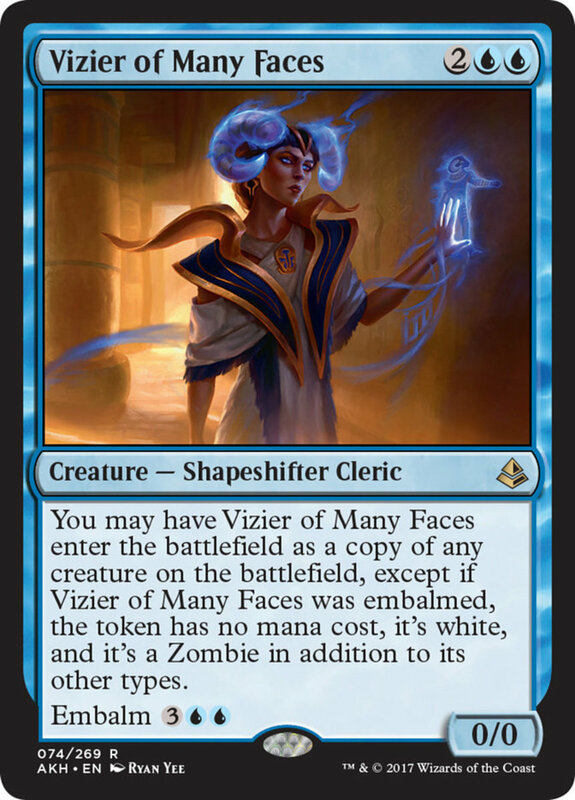 Vizier bears the cleric subtype in addition to shapeshifter, offering additional synergies, and like Clone, she can enter the arena as a copy of any other creature. 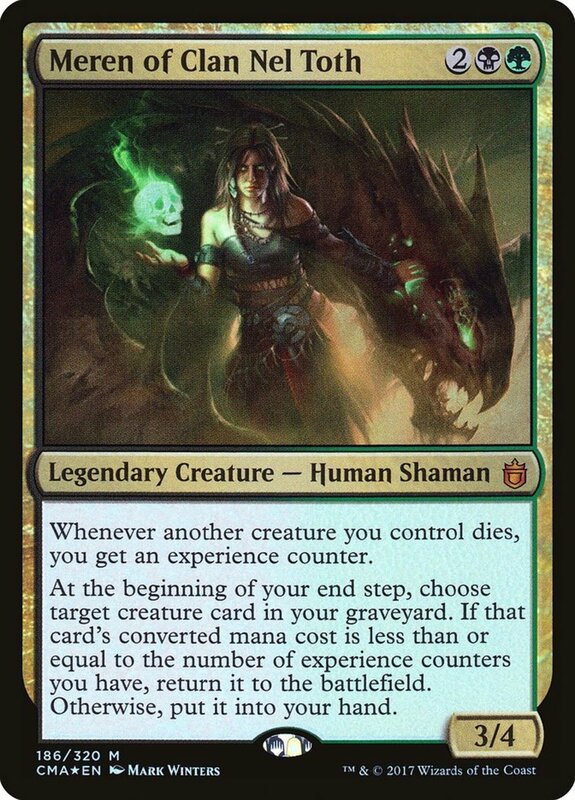 However, while she's in your graveyard, you can use Vizier's embalm ability: by spending five mana, you exile her but create a token copy that's a white zombie in addition to its other types. For just one more mana, this gives Vizier a second entrance, providing yet another subtype in the process. Note that her embalmed form only counts as white, a useful check against enemies with protection from blue. 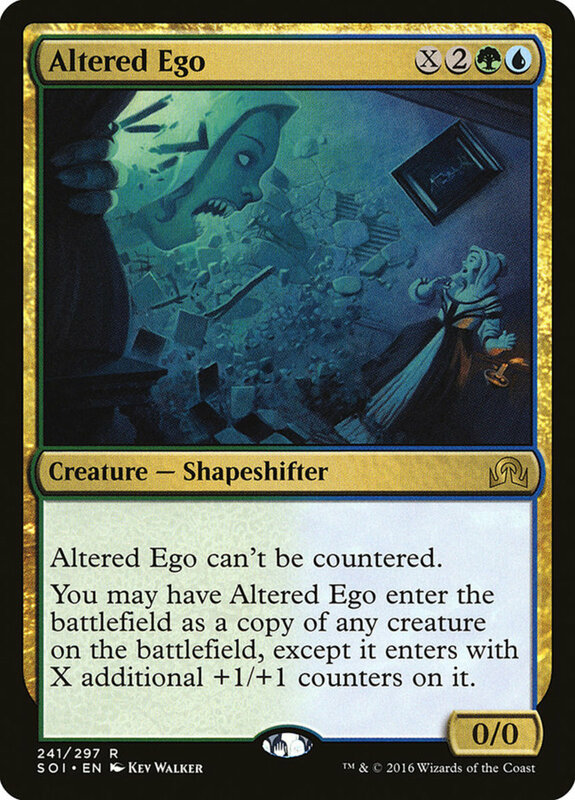 Altered Ego needs both green and blue mana, but it can't be countered, preventing blue-wielding opponents from negating its entrance. It copies any creature on the field, and you add X +1/+1 counters to it depending on how much extra mana you pumped into Ego. Thankfully, you can still cast Ego with just four mana (and have X be zero), in which case you'll gain your copy, just without any extra counters. Essentially, for the minor inconvenience of needing two colors, Ego adeptly rewards you with anti-counter prowess and potential upgrades. Like Ego, Twin needs two mana colors, this time accompanying blue with black. As usual, you can have him enter as a copy of any other creature, but now your duplicate gains the ability to spend two mana (one blue and one black) and tap to destroy a creature with the same name. Thus, not only can you duplicate your opponent's cards, you'll soon deprive them of their originals. Normally, you'll have to wait a turn before Twin can tap, but if you replicate something with the haste trait (or apply it yourself with equipment like "Lightning Greaves"), Twin can attack or tap as soon as he arrives! 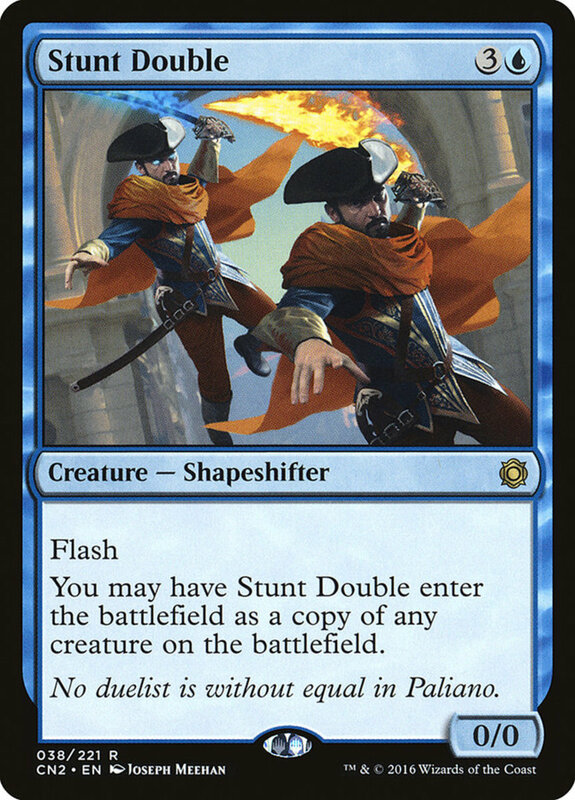 Like so many of today's cards, Stunt Double functions similarly to Clone, needing the mana of four islands and mirroring any creature on the field. However, his bonus flash trait lets you cast him at instant speed, allowing you to wait until your opponent's turn (and see if they play a stronger soldier to copy) before you commit him. Cryptoplasm's duplication has a delay, but he compensates with several excellent abilities that few of his peers enjoy. 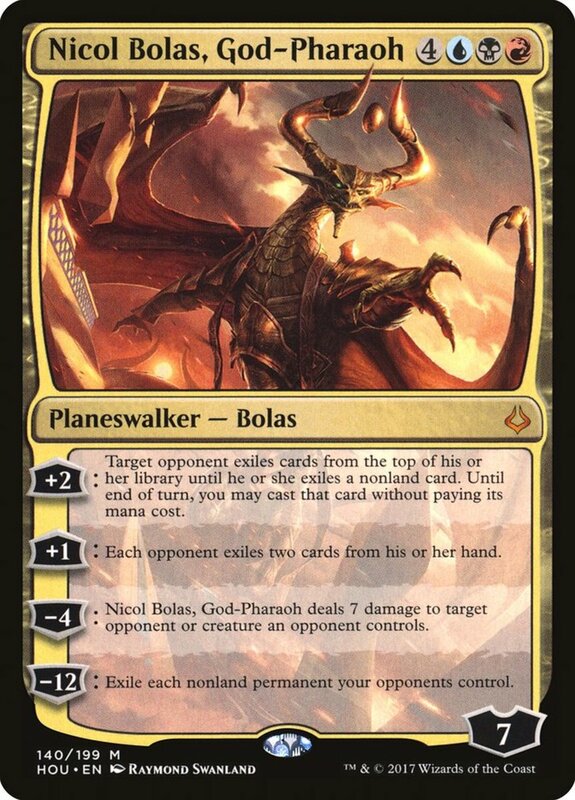 First, he only needs three mana, making him cheaper than most shapeshifters. Then, he carries 2/2 stats, meaning he can survive even without copying something. Finally, he can transform into another creature at the start of your upkeep—but he also keeps his ability, letting you later morph into a stronger creature. 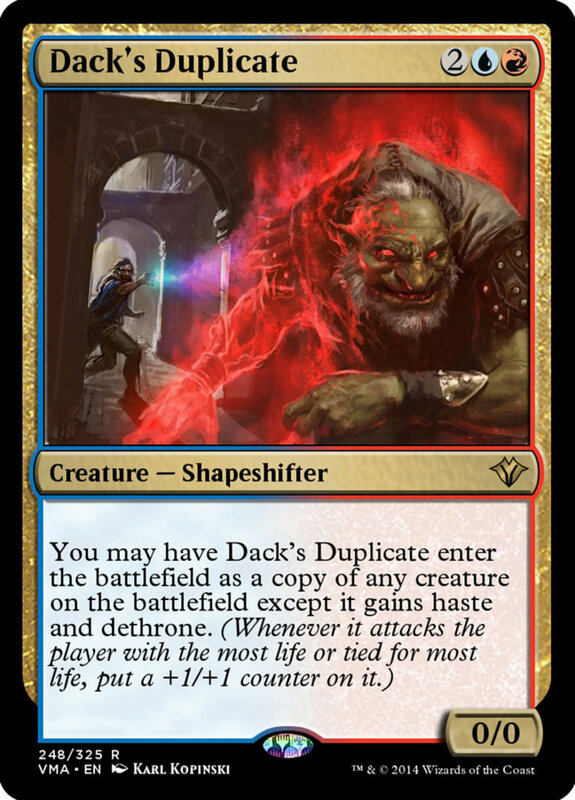 One of the best red/blue cards in the game, Dack's Duplicate yet again copies any creature on entrance. However, your impostor brandishes both dethrone (gaining a +1/+1 counter when they attack the player with or tied for the most life) and haste. 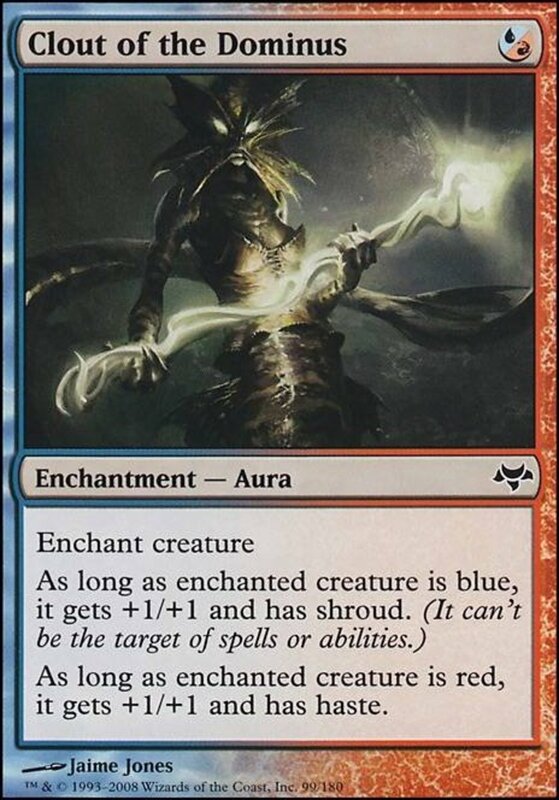 Copying a creature for four mana is already a sweet deal; haste and dethrone added in make Duplicate an easy pick for any blue/red deck I craft. Fortunately, despite his powers, he's surprisingly cheap, often costing well under two dollars! 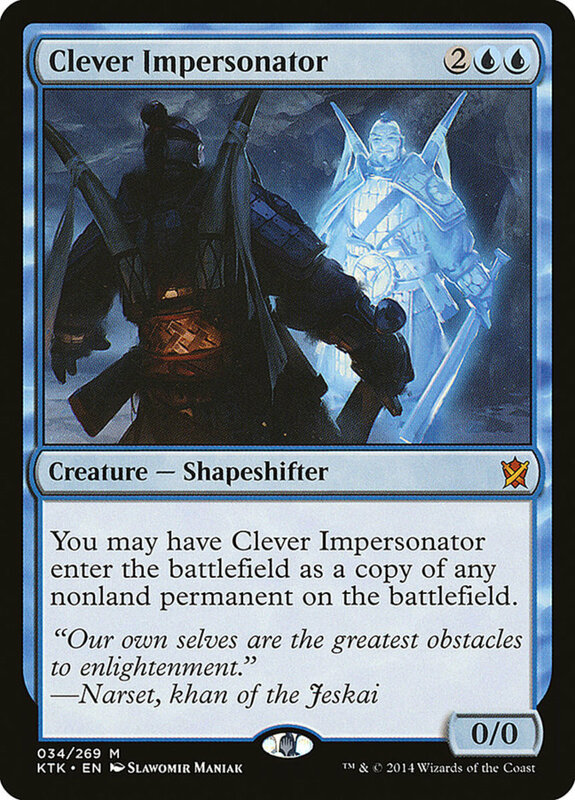 Clever Impersonator only needs blue mana, and he expands Clone's ability by letting you copy any nonland permanent on the field. 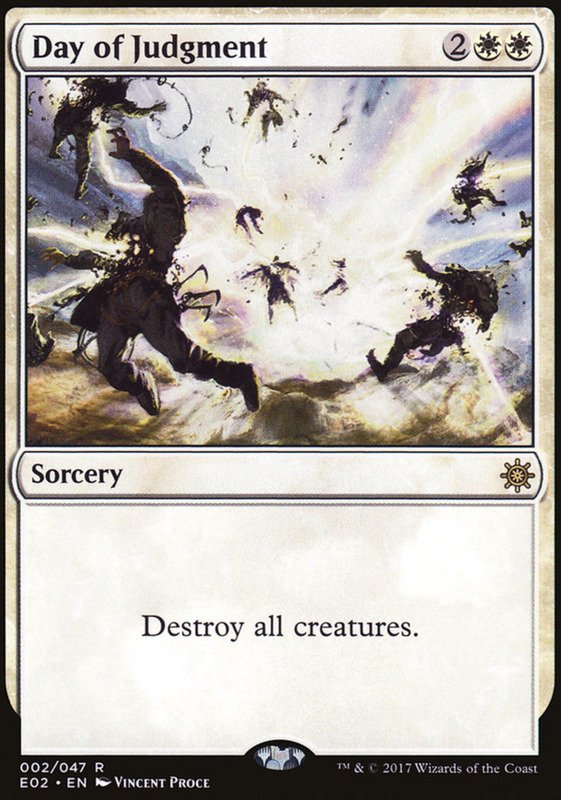 Thus, you can duplicate artifacts, enchantments, and even planeswalkers in addition to creatures, letting you reflect your foe's strongest card regardless of type back at them. Of course, you can also copy your own units, but remember the legend rule when doing so. 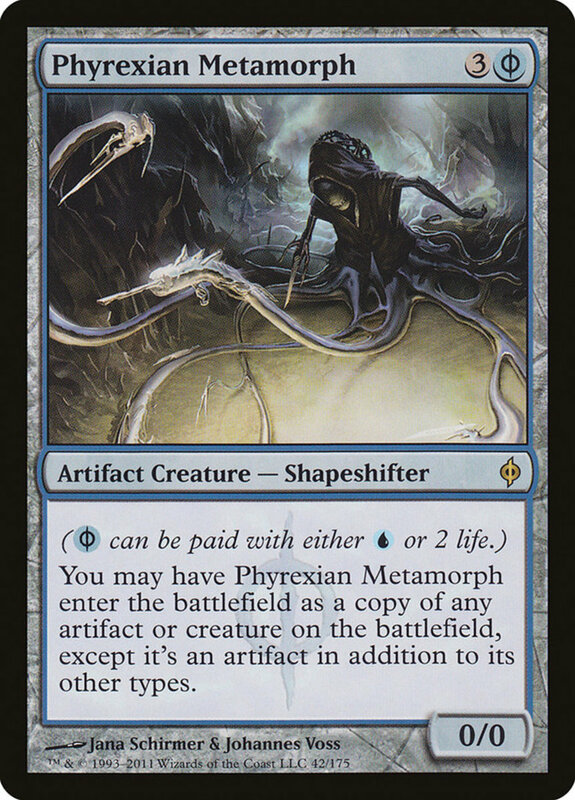 Metamorph is an artifact creature, qualifying for all types of creature/artifact supports (and removals), and he stands above the shapeshifter crowd with two excellent abilities. First, he can copy artifacts in addition to creatures (and copied monsters become artifact creatures). Then, his phyrexian mana symbol lets you satisfy its cost with either one blue mana or two life, letting you fuel Metamorph's entrance with either resource. Versatile in both cost and functionality, Metamorph remains Magic's best shapeshifter and a potent force in any deck. 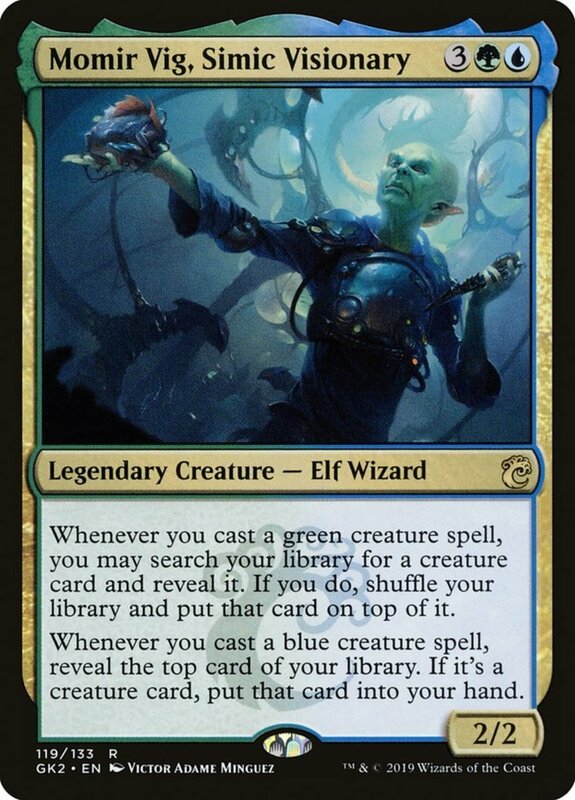 In commander format, keep in mind that even though you can cast Metamoprh without blue mana if you spend two life, his color identity is still blue, so don't try squeezing him into non-azure decks. Shapeshifters are handy tools when deck-building, as you can easily swap those with changeling in and out of any deck list, as they'll synergize with whatever creature subtypes you're running. Use them to mirror intimidating, high-cost enemies (like angels and eldrazi) for a fraction of the mana your opponent paid. They also work great in multiplayer, as the more rivals you face, the more permanents you'll have available to mimic. 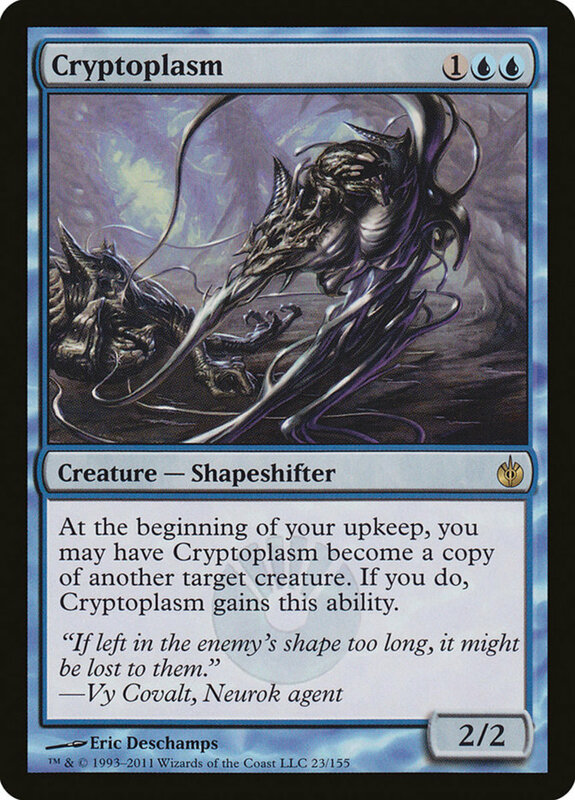 Shapeshifters remains one of my favorite subtypes that have an astonishing number of competitive entries, and I definitely recommend testing them yourself. But for now, as we eagerly await Wizards of the Coast's next expansion of monster-imitating fakes, vote for your favorite card and I'll see you at our next Magic countdown!